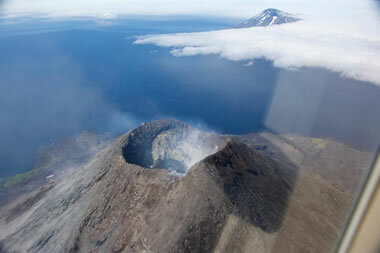 One of the most active volcanoes in Alaska's Aleutian Island Arc and a threat to international and local air traffic. Mount Cleveland Volcano erupting a plume of ash that is being carried to the west-southwest by wind at an elevation of up to about 6000 meters (about 19,700 feet). This photo was taken by Jeff Williams, an astronaut aboard the International Space Station, on May 23, 2006. Mount Cleveland Volcano: A photo of Mount Cleveland taken on July 24, 2016. This image shows Cleveland's steep stratovolcano geometry and minor degassing from the summit. Photo by John Lyons, Alaska Volcano Observatory / USGS. 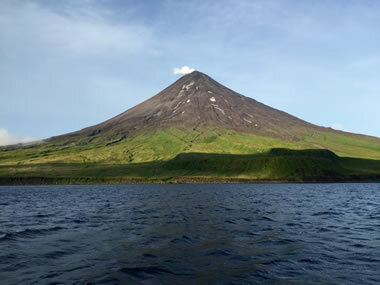 Mount Cleveland, also known as Cleveland Volcano and Chuginadak, is one of the most active volcanoes in the central part of the Aleutian island arc. It is a stratovolcano that comprises the entire western half of Chuginadak Island. The portion of the volcano that is above sea level is about 8.5 kilometers in diameter (5.3 miles) and rises to an elevation of 1,730 meters (5,675 feet). The volcano has been the site of recurrent eruptions throughout the recorded history of this area. It has produced many eruptions since 2000. Ash plumes from these eruptions are a threat to air traffic between North America and Asia. Volcanic ash can damage the exterior of an aircraft. It can also be pulled into jet engines, where it melts, accumulates, and can cause engine failure. Mount Cleveland and Herbert Volcano: Summit of Mount Cleveland, with Herbert Volcano in the background. Photo by John Lyons. Image and caption courtesy of AVO/USGS. Map: Where is Mount Cleveland? Cleveland Volcano map: Map showing the location of Mount Cleveland in the Aleutian islands of Alaska. The boundary between the North America plate and the Pacific plate is shown by the gray toothed line. The North America plate is to the north of this boundary, and the Pacific plate is to the south of the boundary. The A-B line shows the location of the cross section below. 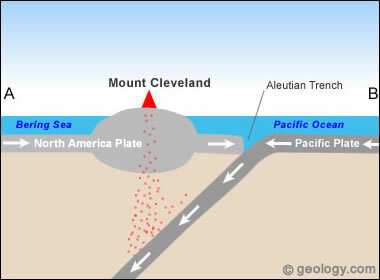 Mount Cleveland plate tectonics: Simplified plate tectonics cross section showing how Mount Cleveland is located on an island above a subduction zone formed where the Pacific plate descends beneath the North America plate. Magma produced from the melting Pacific plate rises to the surface and erupts to form the volcanic islands of the Aleutian island chain. The Aleutian Islands were formed by interactions between the North America and Pacific plates. They are located on the southern edge of the North America plate where it collides with the Pacific plate (see map) to form a convergent plate boundary. In this area, the location of the plate boundary is marked on the ocean floor by the Aleutian Trench. At the plate boundary, the Pacific plate is moving to the northwest and in collision with the North America plate, which is moving in a southerly direction. At the boundary the Pacific plate descends steeply into the mantle to form a subduction zone (see cross-section). As the plate descends into the mantle, its temperature rises and some of the rock begins to melt. Water contained within sea floor sediments carried down with the plate facilitates melting. Magma bodies produced from this melting are lighter than the surrounding rock and will rise towards the surface. The magma bodies can cool within the crust before reaching the surface or contribute to a volcanic eruption. 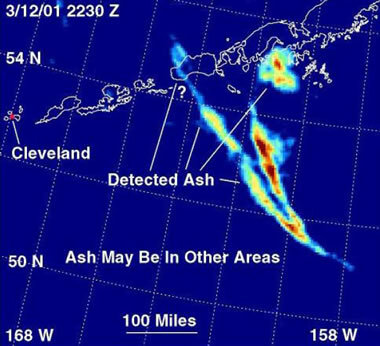 Cleveland ash plume: GOES satellite image of an ash plume released by an eruption at Mount Cleveland on February 19, 2001. This ash cloud rose to an altitude of 30,000 feet (about 9 kilometers). 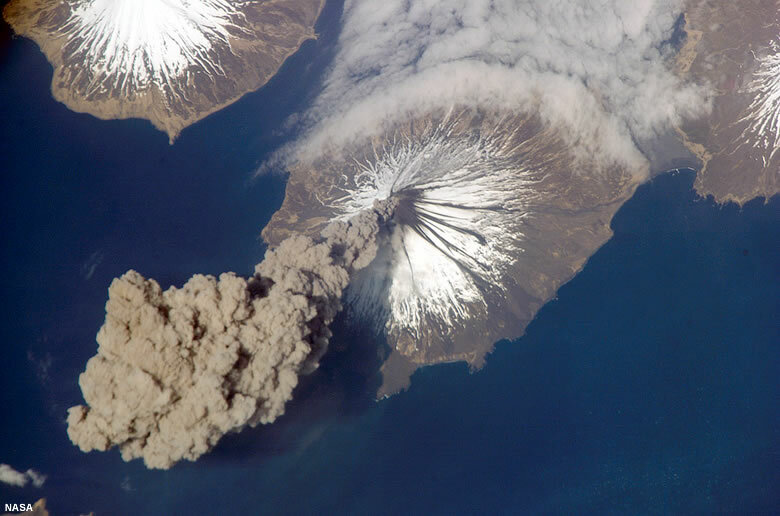 The Alaska Volcano Observatory relies on satellite observations to detect eruptions of Aleutian volcanoes that are otherwise difficult to monitor. The red and yellow plume is ash being distributed by winds. NASA image. Cleveland ash plume: GOES satellite image of an ash plume from Mount Cleveland being spread by the wind. This image shows how a single ash event can spread to disrupt an air space that is hundreds of miles in width. NASA image. An important danger posed by an eruption at Mount Cleveland is an ash plume that rises high into the atmosphere. In May 2001, eruptions at Mount Cleveland sent ash plumes to an elevation of about 30,000 feet (about 9 kilometers). Airborne ash can damage the instruments and engines of overflying planes. When an ash eruption occurs, air traffic must be rerouted. This disrupts schedules and significantly increases fuel costs. Mount Cleveland is an uninhabited island in a remote part of the Aleutian Island arc. The nearest settlement is at Nikolski, about 50 miles (75 kilometers) away. Because this area has historically been poorly monitored, minor eruptions may have gone unnoticed. Because several volcanoes are located close together, there has been difficulty assigning eruptive activity to a specific volcano. Today eruptions in this area are monitored by the Alaska Volcano Observatory. AVO has daily access to remote-sensing data from a number of satellites. They use this data to monitor for ash in the atmosphere and thermal anomalies on the ground. This data can detect heat produced by lava flows, ash eruptions, and very shallow magma. This type of information was used to detect the eruption on February 19, 2001, which sent plumes of ash to an elevation of 30,000 feet (about 9 kilometers), disrupting air traffic. A small network of seismographs is needed to detect and map the earthquake activity produced by magma moving beneath a volcano. AVO does not have this type of monitoring on Chuginadak Island. It does have access to earthquake information from the United States Geological Survey's Earthquake Hazards Program, which would detect a very large eruption but not detect minor activity that would produce an ash plume. 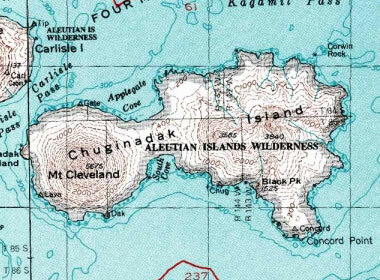 A topographic map of Chuginadak Island. Mount Cleveland forms the western half of the island. According to the oral history of the Aleut people, this was once two islands. Debris from a Cleveland eruption formed the isthmus between the two halves of the island. 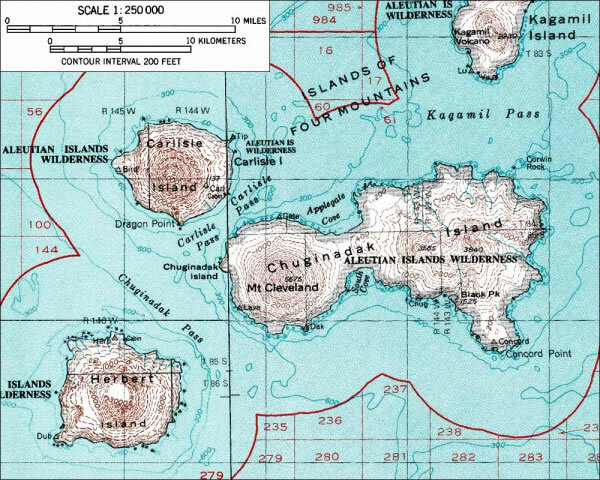 Enlarge for a view of this map that shows adjacent Kagamil Island, Carlisle Island, and Herbert Island. Cleveland Volcano Eruptions: Chart of the eruptive history of Cleveland Volcano by century. The greater frequency of eruptions over the last century can most likely be attributed to closer observation and greater interest. Data from the Alaska Volcano Observatory. Did You Know? AVO has a webcam pointed at Mount Cleveland. It is located on High Hill, near the village of Nikolski, on Umnak Island. Mount Cleveland is about 45 miles (72 kilometers) from the camera and can be seen on days with excellent visibility. Cleveland Activity Page: Alaska Volcano Observatory. Cleveland Volcano Summary: Smithsonian Institution, Global Volcanism Program. 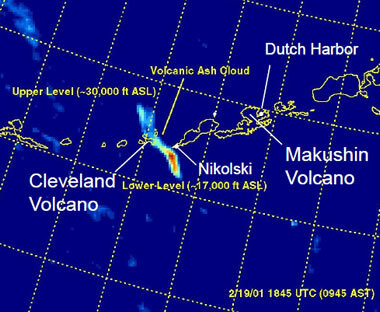 Ash Plume from the Cleveland Volcano: NASA Earth Observatory, article and images from February 24, 2001. Expanded Monitoring of Volcanoes Yields Results: Fact Sheet 2004-3084, revised 2009, United States Geological Survey. 2001 Volcanic Activity in Alaska and Kamchatka: Summary of Events and Response of the Alaska Volcano Observatory, United States Geological Survey Open-File Report 2004-1453. The earliest history of Mount Cleveland is the oral record of the Aleut people. They realized that the mountain was a volcano and named it "Chuginadak" after their Goddess of Fire, who was thought to live within the mountain. The Aleut people also knew that Mount Cleveland and the other half of today's Chuginadak Island were once separate islands. The isthmus connecting the islands was formed from volcanic debris produced during one of Cleveland's eruptions. The written record for volcanic eruptions in the Aleutian Islands area begins in the early 1700s. At that time very few people travelled near the island, so eruptions there could go unnoticed and unrecorded. Today the closest settlement is at Nikolski, about 50 miles (75 kilometers) away. Small eruptions at Mount Cleveland could go unnoticed. If an eruption was noticed, it could be very difficult to attribute it to Cleveland or another nearby volcano without visiting the area for close observations. 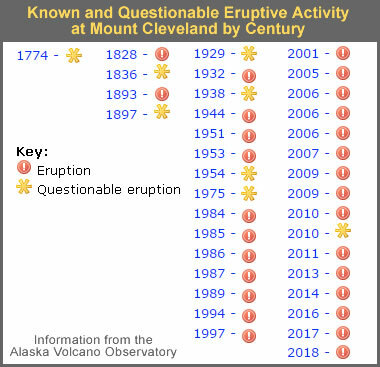 For the above reasons, the eruptive history of Mount Cleveland is incomplete and contains uncertainty. The eruption chart on this page shows just one eruption for the 1700s - and the attribution of that eruption to Mount Cleveland is questionable. There could have been many more eruptions that went unnoticed or unrecorded. The island was more regularly seen by ships in the 1800s, by aircraft in the 1900s, and by continuous satellite monitoring in the 2000s. This increased observation probably explains why the recent record shows a greater number of eruptions. Activity at Mount Cleveland typically produces ash plumes, lava flows, pyroclastic flows and lahars. It has produced VEI 3 eruptions several times. These occurred on: February 6, 2006; February 2 (? ), 2001; May 25, 1994; June 19, 1987; and June 10, 1944. The Smithsonian Institution has brief descriptions of historic eruptions and more detailed descriptions of recent activity. Today the incentive to monitor volcanoes in the Aleutian Islands is very high because of the risk that they present to air traffic. Ash clouds can damage aircraft and cause jet engine failure. The Alaska Volcano Observatory is operated as a joint program of the United States Geological Survey, the Geophysical Institute of the University of Alaska Fairbanks, and the State of Alaska Division of Geological and Geophysical Surveys. AVO was formed in 1988 to monitor Alaska's hazardous volcanoes, predict and record eruptive activity, and mitigate volcanic hazards.